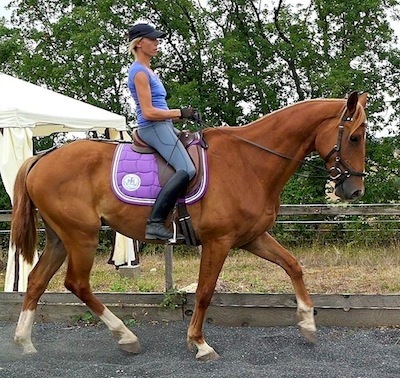 Our dressage tips are about helping you to get a better connection with your horse both gymnastically and in your training rapport. What we call real dressage (to distinguish it from dressage based on superficial appearances) is founded on the gymnastic phenomenon of engagement, which involves the biomechanics of horse and rider connecting and operating in a particular way that creates balance and stability within a free flow of movement. It is a sad fact that many dressage riders never experience this wonderful state, constrained by requirements for precision and control, but once you do feel it, you will probably never want anything else from your riding! In good dressage, all corrections start with the rider. Here are some basic but essential ways you can start to find the right position to connect with your horse in a way that promotes engagement. Walking your horse on a loose rein, focus on your seat's interaction with the movement, breaking it down in your mind: can you feel your lower back stretch with every stride, being pulled into the movement, or is there more emphasis on a moment of compression (hollowing) in your lower back? If you don't feel your lower back stretch, roll back on your seatbones, dropping your tailbone until you can feel the movement pulling your seat under and stretching your lumbar back every stride. Now you are connecting with the forwards phase of the hind-leg thrust, where true transmission happens. See if you can support your seat into the tuck phase each stride (which is also when your horse is tucking his/her pelvis) by engaging your abdominals as if you were doing a sit-up. Imagine you are trying to make your horse linger a bit longer in this moment. The other phase of the stride, in-between each tuck moment, is when the horse is stretching out each hind-leg and is more likely to hollow. This is when your lower back is also likely to hollow, at the same time as your abdomen pushes forwards. Use your engaged abdominals to resist this rocking forwards of your pelvis - feel the tug of each hind-leg pulling against your toned stomach muscles. 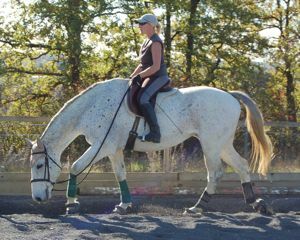 If you can get this connection with your seat, you should start to notice that your horse slows down and wants to stretch his head and neck down, raising his back (make sure you are not blocking him in front with the rein contact!). NB. The above dressage training tips are the foundation of how a rider can use their seat to initiate engagement - you will need to keep re-applying them and, over time, studying the effects on your horse in order to understand their significance. If you stick to this way of sitting, eventually you will gain enough postural strength to begin to channel and re-balance the horse's movement with your seat, and achieve consistent engagement. In sitting trot and canter prioritize your tucked seat position, don't worry about your legs going forwards until your seat is strong in this position. In rising trot prioritize your leg position. Work on stretching your thigh back under you, and sinking your lower leg back and down. To develop the stretch in your hip joint and develop your balance, try to keep your upper body back as much as possible, tucking your pelvis into the rise (photo, right). In walk you can try to work on both seat and leg more simultaneously, see how much you can sculpt your leg under you while maintaining the seat connection described above. Make sure your stirrups are not too long to assist you in developing the correct leg - if you hang your leg loose, the base of the stirrup iron should hang no lower than the level of your ankle bone. These dressage training tips for the riding position may seem basic, but they form the foundation of the correct position and its interaction with the horse. Many riders sacrifice the correctly tucked and connected seat for a 'good' leg position, because the leg is more visible; they then sit with a fork seat perched against the horse's movement. Acquiring both a good leg AND seat is the work of years of persistent effort and diligent correction, but it is well worth it in the end. Put your horse on the lunge with only a cavesson - no bridle, saddle or side-reins. Are you able to initiate a fairly consistent longitudinal stretch (when the horse drops his head almost to the ground, at the same time as lifting his back) in walk, trot and canter? Can you maintain a steady contact in the lunge-line? If your horse doesn't stretch or falls in on the circle, you need to work on bending and alignment. See Lunging A Horse Well: The Best Foundation For Training for more information. 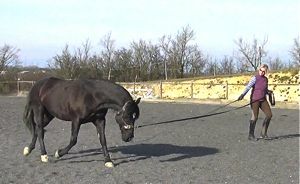 Lunging in the same way as above, see in trot how slowly you can get your horse to maintain the trot without breaking into walk, or falling in on the circle. This encourages the horse to use his postural muscles to carry himself instead of rushing, and he will be much more likely to stretch longitudinally. 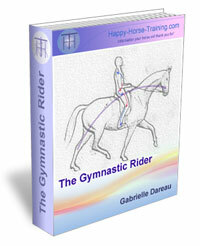 Working in hand, still with the cavesson, position yourself at your horse's girth and walk him in a small circle. With one hand holding the line near his head, place your other fist on the widest part of his belly, and ask him to move sideways away from you by applying pressure, while bringing his head towards you slightly to maintain the bend (photo, right). Does your horse yield away from the pressure fairly easily, or does he resist? This tells you how well he will yield to your leg under saddle. 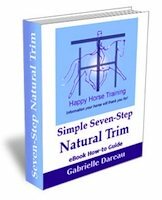 These dressage training tips give some useful pointers, but for a comprehensive guide to lungeing and other work on the ground look at the HHT e-book How To Train A Horse Without Force. A unique, in-depth guide to training; it shows you not only how to build a relationship based on mutual trust, but also how to establish the right gymnastic development in your horse. 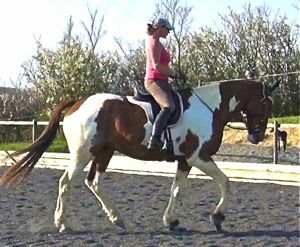 When working on any bending work - such as circles, shoulder-in and so on - experiment with releasing your outside rein contact, i.e. pushing your outside hand forward in a sustained full yield. How does your horse react? If he falls either in or out on the bend, raises his head, or rushes forwards, these are signs that you have been containing sheer forces with your outside rein. 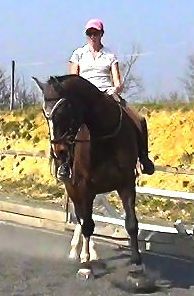 The outside rein is used very commonly to hide many evils - and riders are often taught that it is a necessity to balance the horse. In fact, this balancing can only be genuinely accomplished with your leg, weight and posture. 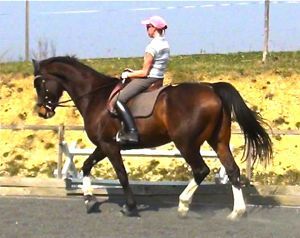 - If your horse falls in when you release the outside rein, you need to use more inside leg to get him yielding around it. Your weight is probably being pushed to the outside also. - If your horse falls out, you need more outside leg to channel the horse onto the bend - stretch it back as far as you can, as if wrapping it around the quarters. Again, make sure you and the saddle are centrally positioned in relation to the horse's spine and not being rolled to the outside (or, more rarely, dropped too much to the inside). If your horse is genuinely balanced from your leg and posture, releasing the outside rein should only result in an increased softening onto the bend and into the inside rein, with no loss of balance or direction. NB. It is especially useful to do the exercise in the above dressage training tip in shoulder-in: can you keep your horse yielding sideways in a straight line without holding him there with your outside rein, softening nicely into your inside rein? This is the true verification of a correct shoulder-in - in itself a wonderful tool for generating straightness and engagement. If you can't create angle in your shoulder-in without holding the outide rein, then you need to develop more postural strength to turn the horse's ribcage. If you can't get enough bend or sideways yielding without the outside rein than you need to establish more inside leg aiding and yielding response from the horse. In all cases, it is vital that you don't allow your weight to be pushed to the outside by the horse's ribcage rotation. Make sure you give your horse frequent enough rests during a schooling session. 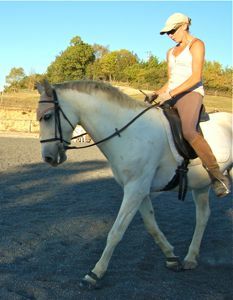 A rest means giving the rein out fully to the buckle, so that the horse can stretch his neck down and rest the muscles. This should be done every 5 to 10 minutes maximum, for a good few minutes of loose walking on both reins. How your horse reacts when you give the reins out like this is a very good indication of the quality of your work beforehand. When a horse has been working in engagement, with a good longitudinal flexion, he will naturally drop his head right down in a full stretch when you let the reins out, striding out in a big relaxed walk. If you feel you need to fiddle with the reins to encourage him to drop his head (something unfortunately seen in the loose/extended walk even at top-level competitive dressage) then your horse probably wasn't working with a longitudinal stretch when he was on the contact. We hope these dressage training tips towards work in engagement and without tension are useful to you and your horse. Remember that real dressage is about riding from the inside-out. Always prioritize your feeling of what's right - what feels good in terms of balance and connection - over external appearances or actions, such as your horse's precision and response to signals. 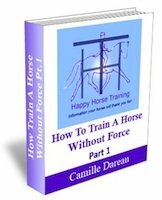 The pages on Happy Horse Training are so wide-ranging and interrelated that we strongly recommend that you look at the site plan to find other subjects that may interest you. return to HHT's main dressage page: What Is Real Dressage Riding?